Since it’s a Saturday and my day is more relaxing (or at least that’s what I keep telling myself as I stare at mounds of books…) I decided to be adventurous and make dinner, something fancier than I normally would. My inspiration for my meal came from Pinterest—probably one of the best sites for pictures of mouth-watering food. As I was practically drooling in my seat, I came across a recipe for a Mediterranean salad. That was it. That was what I wanted for dinner. So I practically jogged to Shaw’s to get the ingredients. I have to say, if you’re on a budget, this meal is perfect for you. Luckily today, some of the produce at Shaw’s was on sale (the lottery for a broke college girl like me), so nothing cost me over fifteen dollars. 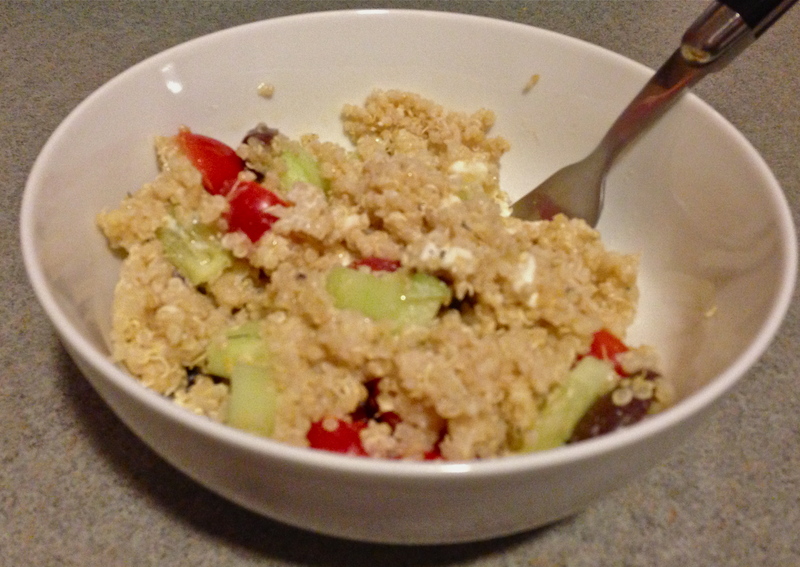 All you need is quinoa, a cucumber, olive oil, grape tomatoes, olives, feta, and a red onion. Unfortunately I didn’t incorporate red onions into my meal because Shaw’s had an ominous-looking selection and I didn’t want to take my chances. There’s an even better reason why you need to make this meal. You don’t even need to be a “chef” to make it. The hardest part is cooking the quinoa according to the instructions on the bag. No measuring needed. After the quinoa is done, chop up all your veggies—as many or as little as you want—toss in some feta, drizzle it with olive oil and a pinch of lemon juice and viola! there you have it—a deliciously cooked meal. I took some liberties with the recipe and mixed in a few heaping scoops of tzatziki sauce (it has become my new favorite thing, I try to find excuses to use it with everything). I’ve never been to Greece and have accepted that this is as close as I’ll probably ever get. Even though my meal might not have been as good as a meal from Greece (I would argue that is debatable), it was an easy, quick, and cheap meal that I would definitely make again. But until next time, keep eating!